Remember that time I had a port put into my chest? I frequently joked at the time that the port made me like Iron Man, but I didn’t realize that the port removal would actually look a lot like this scene in the movie. As this blog has established repeatedly, I am one of the most squeamish, vasovagal responding dudes you will ever meet. While I’ve never actually passed out, I’ve come mighty close on many occasions when nurses have failed to properly insert a needle in my vein (and sometimes even when they’ve done it properly). I insisted on full sedation for the insertion of my port (which is frequently completed under “twilight” sedation for many patients), so I was incredibly shocked when my request to be unconscious for the removal of said port was rebuffed by my oncologist and volleyed with the news that my chest would be cut open and the port plucked out while I was fully awake at a mere doctor’s office visit. Today, that’s exactly what happened. And it was fine! Before we talk about the removal process, let’s pause for a moment and give it up for my port. For the last seven months it’s been quietly residing in my chest and unassumingly doing its portly duty of delivering chemotherapeutic poison to an arterial vein. It was the unsung hero of my treatment and the savior of my arms from countless more needle pricks, as well as burning sensations and other nasty side effects I’ve read about but avoided thanks to the chemo entering my port instead of my arm veins. Also, I didn’t notice this until I actually took a photo of it yesterday, but it’s also had a retro Chicago Cubs logo hidden inside it this entire time! I guess it’s the closest I’ll ever come to having a Cubs tattoo. I love you, port. Well done, good and faithful servant. But even the most useful things can outlive their usefulness, and the port’s time had come. The removal ceremony was purported (sorry) to be at the office of the surgeon who had originally implanted the port. Theresa and I arrived bright and early for our 9 a.m. appointment, but the office was dark and empty. Fortunately it just turned out that everyone was running late, so a nurse eventually showed up and I filled out the appropriate paperwork. It wouldn’t be a doctor’s visit without a lot of waiting, and this one did not disappoint in the “sitting around in a treatment room” department. Shortly after 10 a.m., we entered another room that was fully set up for deportation. 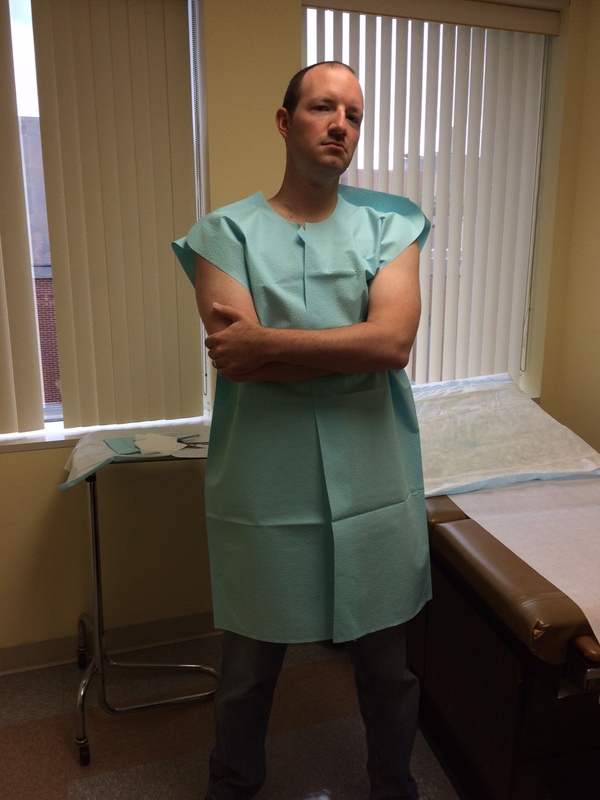 I changed into yet another stylish hospital gown and mentally prepared myself for the procedure. I think the long wait had left me feeling surprisingly calm, plus the surgeon, the nurse and the resident were all incredibly friendly and reassuring. It felt good to be surrounded by medical professionals who were outwardly happy for my conquering of cancer and joined me in making this a celebratory milestone of my journey. Once I was reclined on the examination table, it was go time. The surgeon warned me that the only pain I should feel was the pinch from the anesthesia being injected into my chest–and it was quite a pinch. “It’s going to sting and burn a little…you can sing if you want to,” she said. I didn’t do any singing, but maybe a little howling. Eventually my chest stopped feeling like it was on fire and I wasn’t feeling much of anything. A sterile cloth was placed around the port area and slightly covering my face, so I couldn’t really see what was going on (not that I wanted to), but the surgeon kept prepping my now numb chest. “Do you feel any pain? You don’t have to be a man just because there are so many women in here,” she said. I honestly didn’t feel any pain, just a little pressure. The surgeon said the hard part was over, and I felt a liquid trickle down over the top of my shoulders. Was that my blood? Had I been cut open already?! The adrenaline rush from the burning anesthesia needles left me sweating and jittery, and I realized that the non-numb rest of my body was incredibly tense. I knew that I was at a potential vasovagal crossroads, so I consciously decided to relax my body and it actually worked! The procedure continued and Theresa started shooting video. While the surgeon did not want us to post the video, it documents a truly remarkable few minutes of medical wizardry. There I am, nonchalantly talking to everyone about such diverse topics as where the resident went to medical school and how we might go about populating Mars. Meanwhile, the video clearly shows that the surgeon is cutting open my flesh with scissors and yanking the port out of the flesh wound like Winnie the Pooh out of Rabbit’s house. “It’s a boy!” the surgeon proclaimed, as she pulled the port fully out of my chest and applied pressure to the opening. She told us that I’m a big boy with big veins and that the catheter on my port was the equivalent of a size XL–a full 30 centimeters! (If only she knew about my larger-than-life spleen…) I’m actually really glad that I didn’t know how long it was and how far it was traveling through my vein to reach my heart. 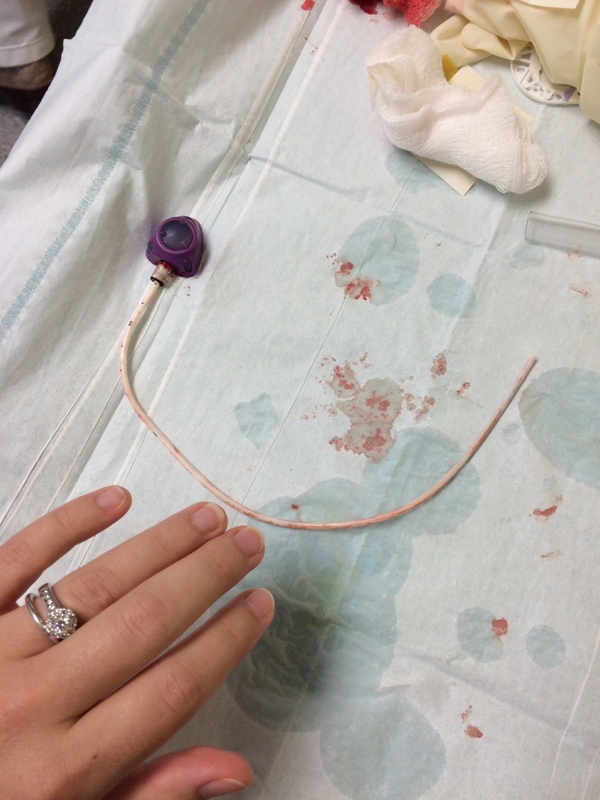 If I had known, I’m sure I would have psychologically “felt” the catheter in my vein and caused even more insane stress for myself. All’s well that ends well. I asked if I could keep the port, in the hopes that this could become a family heirloom, a rearview mirror decoration or at least a physical memento of the journey, but apparently that’s not, um, legal or something. We had to settle for a photo, with Theresa’s hand included for scale. Beyond the hidden Cubs logo, it turns out my port was also purple. Some things are simply meant to be. Now I’ve got a bandage on my chest and a wound covered in steri-strips that will take four weeks to fully heal. Most importantly, I don’t have a port anymore. To me this is a vote of confidence from the medical community that I have beaten the cancer and no one expects it to come back. My return to a fully normal life continues every day and soon I’ll have a scar with a story instead of a chest protrusion that prevents me from lifting anything over 10 pounds. I don’t think I’ve ever been this excited to start exercising again. Who wants to go for a run? Wow! What a remarkable story and journey you’ve been through. And you’ve got a great sense of humor to boot! Congrats to you and good health! Awesome story you are one of the lucky ones so happy for you. Here’s to the Journey! I just finsished my 8 month long battle with Hodgkins Lymphoma. I had ABVD chemo every 2 weeks thru a port just like yours. Did you or do you continue to have muscle and bone pain? I just keep hurting in my leg, lower back and hip as well as my knees. Just curious as too when this will end ? Sorry to hear that! I’ve read that bone pain is a side effect of chemo, but I was lucky to not experience that. Hope it clears up soon!